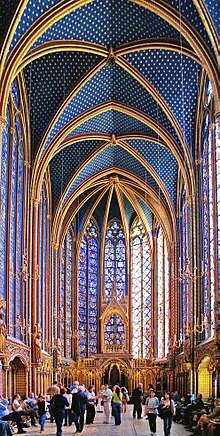 The royal chapel is a prime example of the phase of Gothic architectural style called "Rayonnant", marked by its sense of weightlessness and strong vertical emphasis. It stands squarely upon a lower chapel, which served as parish church for all the inhabitants of the palace, which was the seat of government. The king was later recognized as a saint by the Catholic Church. His title became Saint Louis.